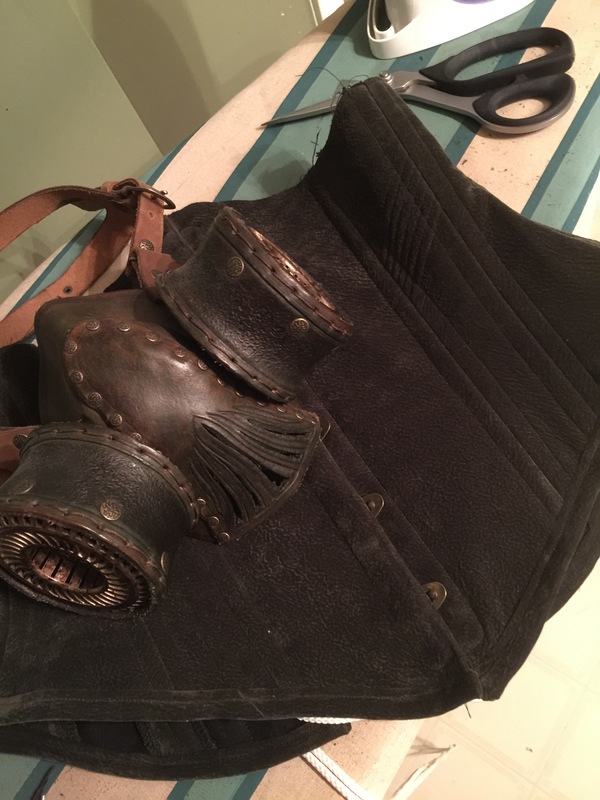 Last summer at the local Fringe Festival, i bought a costume piece from a local leatherworker (Of The Gods’ Blood Armory, fyi)—a steampunk-y (or maybe that’s dieselpunk?) 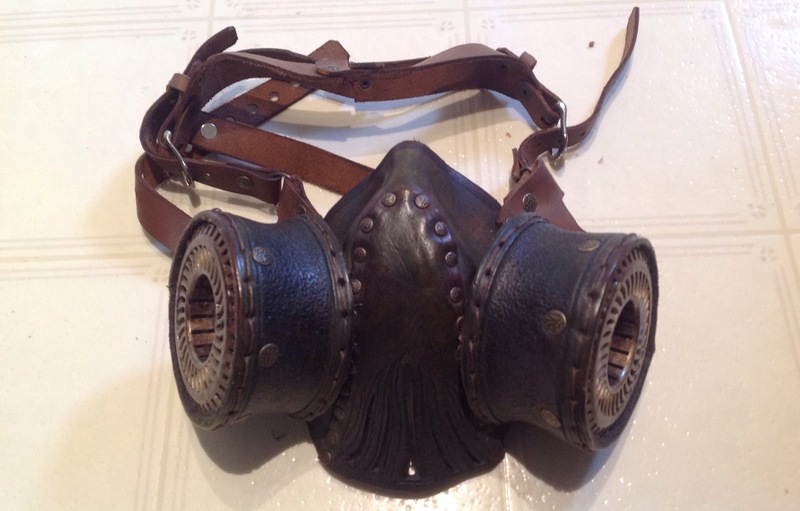 faux gas mask. It was an impulse purchase, completely unjustifiable by any measure except that I was supporting a local artisan, and I love it to bits. But it obviously needed an outfit. I have a few bits of army surplus gear from here and there, but nothing at all cohesive, and the army-greenish colour is not part of my usual palette. A corset was an obvious pairing, but I didn’t have any fabric that immediately spoke to me. Except that I did. Whilst digging through the stash looking for something to complement the sweaterknit for my dad’s cardigan, I stumbled on this textured faux-suede that I acquired when a co-worker was de-stashing. It’s olive green, although that particular variety of olive green that looks mostly brown under fluorescent light. First off, this is NOT the sturdiest method of making a corset. It’s the same one I’ve used for all my corsets, and I havne’t burst a seam yet, but I’m also not wearing any of them for days on end. Five or six hours at a span, rarely more than once a month, and I’m not going for more than an inch or two of reduction. It’s the method described in “The Basics of Corset Bulding” by Linda Sparks (mainly used because that’s the book I have. 😉 for making an alterable corset. You construct the front piece with the busk and the back pieces with the grommets, first. Then the other pieces are sewn together, and the seam allowances stitched open to make bone casings. 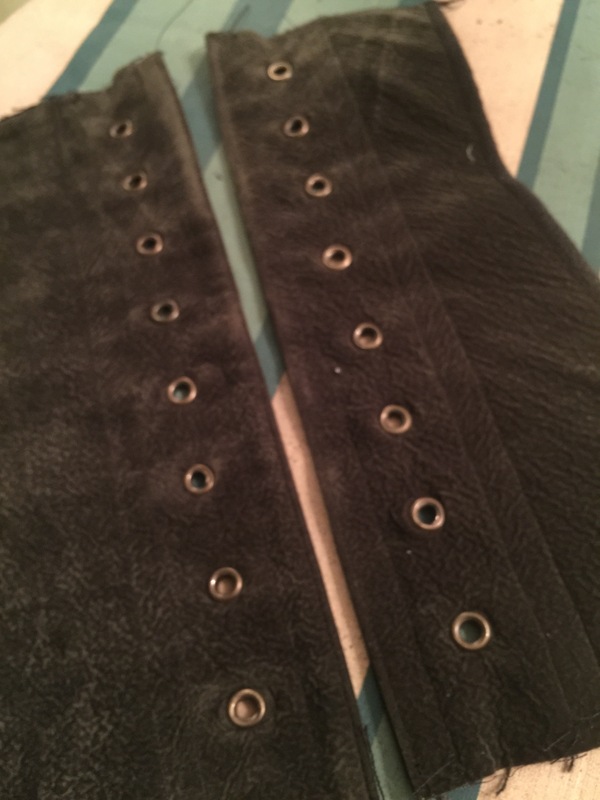 But this time, I put in the bones around the grommets in the back, and then tweaked the fit—finalized some seams and added bones, and tweaked a little more—and so on until everything was just right. This let me get the fit I like, the shape I like, AND end up with a super comfy corset, so I’m pretty stoked. For fun, I added small sections of cording in the front. I think a bigger or firmer cord would’ve been a good idea, but they were fun. And then I completely failed to take blog-worthy photos for almost a year. Sorry? Walking with Wendy Marvel and Terry Bogard. My sister-in-law shot us amidst gorgeous autumn leaves, which are lovely and natural and not really suited to an outfit that demands wrought iron and gaslight, but I wasn’t willing to go further than the next-door park on that particular morning, so I’ll take it. That’s the same white pintucked (not made by me) blouse I wore last year, come to think of it. The camo coat wasn’t actually the best topper for the outfit—it kinda swamped the corset & hip decor, though it looked cool from certain angles. I have enough of the faux suede left to make a matching jacket; I’m thinking something cropped and faux-military would be fun. Maybe in another year? Great outfit! Love the corset! So splendid. I love cosplay. I truly truly do. So many feelings of happy. And the three of you walking down the road.